The March WER report recalibrates the 2015/19 forecast of production floater orders made last October. A combination of a 45% drop in oil prices and an unexpected meltdown of Petrobras have shaken the foundation of the floating production market. As a result around 20% of floating production project starts forecast last October now look likely to be deferred beyond the five year forecast period. Details are provided in the report. 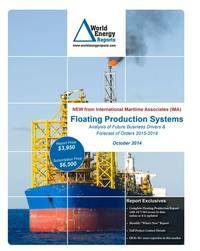 Also included in the report are details for 237 floater projects in the planning stage, 73 production or storage floaters now on order, 260 oil/gas floating production units and 15 floating regas units currently in service and 23 production floaters off field and available for redeployment contracts. Information is current as of 18 March.